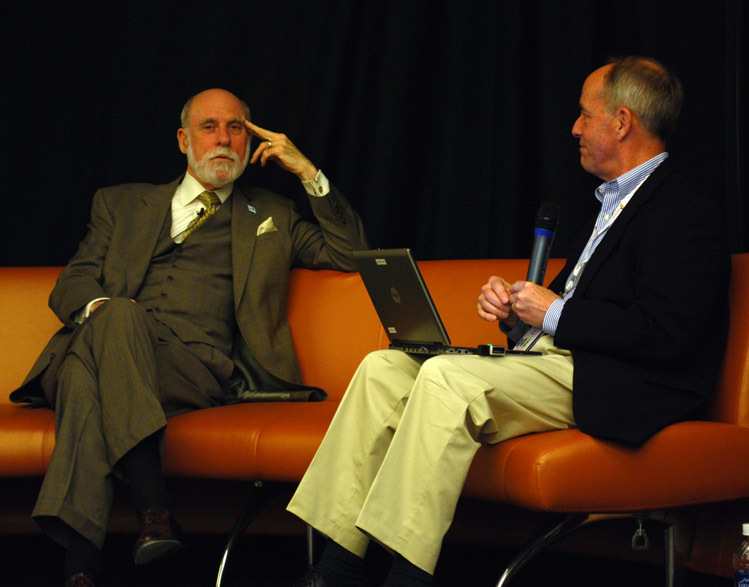 Special session four kicked off just after 4 p.m. with Lee Rainie interviewing Vint Cerf, co-inventor of the Internet Protocol and chief technology evangelist for Google. Cerf helped Rainie establish the Pew Internet Research Center and assisted with its earliest research initiatives. Cerf addressed questions about his position at Google, which he describes as developing in real time; unexpected encounters with the Internet over the years; and the controversy surrounding services in China. Cerf reminisced over the initial stages of the Internet, including the moment when he realized that it would be possible to commercialize the system. Prior to the late 1980s, there had been no attempts to utilize the tool to make money. He said the turning point came in 1989 when commercial email systems were able to connect online to different email systems. Instances of spam mail that followed broke the policy in government that said no commercial traffic could flow through a government-sponsored system. Rainie asked Cerf to elaborate on the “dark side” of the Internet, including the continuing problem of spam. Another problems that Cerf attributed to the dark side is cyberwarfare, which he said occurs on an international level with the general population gains access to technology and abuses it. He said its important to realize that when something because this essential to society’s infrastructure, problems are bound to arise. The important thing is to learn how to cope with the issues. When addressing the question of Google’s management of its China services, Cerf said he is part of a group whose job is to discuss corporate policy. His group has long debated whether Google should offer services to China, because it didn’t want to be in a position where the government could demand information to expose someone. Cerf discussed the economic problems of modern journalism and the ways he thinks the news media can best survive. He said the steady erosion of newspapers began well before the Internet had a strong presence. Journalists should consider the cheapest and most efficient method of distributing news. He said the quality of news reporting is now essential to the success of a publication. “People are going to have to be a little braver about going online and doing things they haven’t done before,” Cerf said.